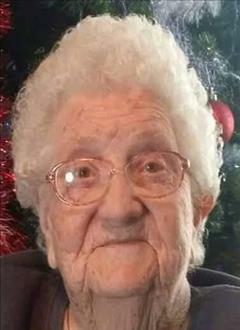 Mrs. Georgia Mary (Strahan) House, of Brundidge, passed away Saturday, January 19, 2019, at her residence. She was 88. Funeral services will be held 12:00 P.M. Saturday, January 26, 2019, at St. John Baptist Church (2158 Co. Rd. 3341 Brundidge, AL 36010); with Rev. Mack King officiating. Interment will follow in the St. John Baptist Church Cemetery. The family will receive friends one hour prior (11:00 A.M.) to services. Keahey Funeral Home of Clio has been entrusted with arrangements. Mrs. House is survived her by grandchildren, Russell (Kristen) Gibson of Jack, AL, Deanna (Buddy) Borden of Cleveland, TN, Joey Gibson of Brundidge; four great-grandchildren, Tyler Brooks, Paul Gibson, Cody Gibson, and Kay (Drew) Ramsey; and three great-great-grandchildren, Brooklyn Metcalf, Astra Ramsey and Axl Ramsey. Mrs. House is also survived by her brothers-in-law, sisters-in-law, cousins, nieces, and nephews. She is preceded in death by her husband, Cecil House; her daughter, Georgeanne Gibson; and her granddaughter, April Watson.